In May 2014, the Waterfront Regeneration Trust (WRT) accepted an invitation from the Georgian Bay Cycling Route (GBCyR) Steering Committee to lead the Georgian Bay Cycling Route initiative with the goal of establishing a 1,000 km cycling route around Georgian Bay as the Great Lakes Waterfront Trail. Implementation has been on-going as part of larger initiatives to expand the Trail along the North Channel of Lake Huron, and most recently into Manitoulin Island, Bruce, Grey and Huron Counties. In May, 2018, the WRT began consultations for the final phase of the GBCyR, closing the gap between Collingwood and Sudbury along Georgian Bay’s east shore. Stage I: Espanola to Sudbury will be complete in Summer of 2018 as part of the WRT’s work on the Lake Huron North Channel cycle route (Sault Ste Marie to Sudbury) and in partnership with Trans Canada Trail, Ontario Trillium Foundation, Tourism Northern Ontario and the Ministry of Transportation. 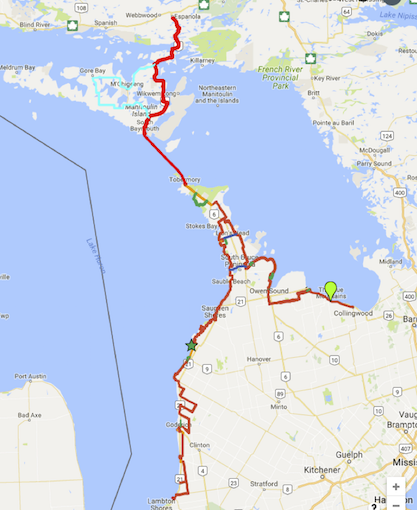 Stage II: Espanola to Manitoulin Island, Owen Sound and Collingwood. In 2017, the WRT expanded the Great Lakes Waterfront Trail and partnership into Manitoulin Island, Bruce, Huron and Grey counties (see map to the right). The work achieves the second phase of the GBCyR, and connects the northern section of the Trail along the Lake Huron North Channel, to the southern sections along Lakes Erie and Ontario. The work will be complete in Summer 2018. Leading project partners include the Ministry of Tourism, Culture and Sport, Tourism Northern Ontario, Regional Tourism Organizations 7. Stage III: Simcoe to Sudbury. Work on the final gap of the GBCyR begins in Summer of 2018 with community meetings to review the route proposed in the 2014 feasibility study. Work is possible thanks to funding provided by the Province of Ontario. The Georgian Bay Cycling Route (GBCyR) will be a 1,000 kilometre, signed Signature Cycling Route around Georgian Bay that connects communities around the Bay to develop the region’s cycling tourism potential. The idea of the route came from the Manitoulin Island Cycling Advocates (MICA) with the initial route researched by Denis Baldwin. Working with the LaCloche Manitoulin Business Assistance Corporation (LAMBAC), MICA established a volunteer steering committee chaired by LAMBAC to oversee a feasibility study for the route. The Study was conducted by Transportation Options and the Resource Management Consulting Group. Funding for the study was provided by FedNor, the Province’s Ministry of Tourism, Culture and Sport and the Heart and Stroke Foundation. 65 representatives of municipalities, tourism organizations, health units and cycling clubs participated in workshops held in Little Current, Sudbury, Parry Sound, Gravenhurst, Midland, Collingwood, Owen Sound and Wiarton or were interviewed by telephone. Support in the Region for the GBCyR is strong. Over 58 letters of support for the concept were received. Of the 1,000 km proposed route, 800 km is ready to be implemented, that is, mapped, signed and promoted. The section between Parry Sound and Sudbury requires the Ministry of Transportation’s support and leadership to close two gaps to create a continous alignment. A third gap exists along HWY 17 by the Spanish River Bridge. The steering committee voted unanimously to invite the Waterfront Regeneration Trust to assume leadership for the initiative, which it accepted. Preliminary route map for phase III of the GLWT / GBCyR expansion as well as the recently implemented expansion on Lake Huron and Manitoulin Island. As consultations progress the map is likely to change, so please check back for the most up-to-date info! Muskoka District – For cyclists with time, Core Route B (62 km) offers a longer, scenic ride along the shore of Georgian Bay Township towards Honey Harbour, than the more direct Core Route A. Completion of the final 200 km between Sudbury and Parry Sound, will require support of the Ontario government and Ministry of Transportation to find a route. In light of the Ontario Government’s 2013 #CycleOn Strategy, the GBCyR Steering Committee has initiated meetings with the Ministry of Transportation to investigate opportunities to make the GBCyR a complete loop around Georgian Bay. The proposed GBCyR has been mapped in MapMyRide, and an overview map is shown here. For a brief description of the gaps, click here. Create a signature cycling route, to strengthen Ontario’s positioning as a cycling destination. Communities along the GBCyR are very supportive of the GBCyR because the infrastructure investment would be low and the benefits would be substantial. Help communities set priorities for cycle route/trail development and enhancement. Complement and further promote the communities and tourism businesses already participating in the Ontario By Bike Network (formerly the Welcome Cyclists Network). New business opportunities to service residents and visiting cyclists.